Before anything I want to thank Viggy for introducing me to Pycon , it’s been amazing experience attending it. Now Pycon. 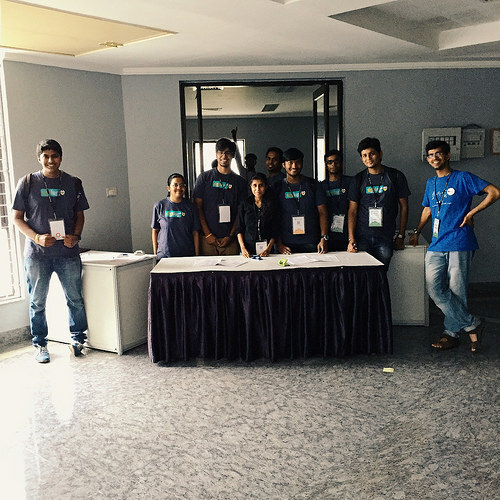 This year Pycon India tried to conduct DevSprint and it was amazing. I got SymPy to work with and I really enjoyed although i wasn’t able to close and issue for them but I learnt a lot. Met these amazing talented lot of SymPy contributors blessed coders for sure. This day I also saw faces behind those “Alphanumeric Nicks” on IRC. Meeting THE RED HAT guy Kushal was an awestruck experience. I met different people form different regions.I was hanging around with the volunteers and the candidate became a volunteer to one of the biggest volunteer driven event. At the end we went for DGPLUG dinner and our virtual group actually came face to face with each other. Since I was volunteering so all of us were given different responsibilities. That days keynote was given by Dr. Ajith Kumar and it was flawlessly beautiful , he conveys different thought with small anecdotes , some of them were Powerless Pointless Presentation, “inertia” of our education system and an indirect hint on MS products. After that I attended many talks and also volunteered for the event I actually came know about different libraries. The day was high on learning and meeting new people. The day ended with Vijay sir taking us out for volunteer’s treat which was an awesome gesture from Pycon India team. Ohh I forgot to mention I gave a lightning talk on Summer Training done by DGPLUG that was hell of an experience and being a part of the ‘EPIC’ staircase meet of DGPLUG was just an icing on the cake. I met Shakthi Sir , I have been reading his blogs and his books meeting him in life was a real pleasure. This day was last day for Pycon and I cannot believe that it’s going to end, it’s the same feeling which you get when you go back to school form a long vacation. Bidding farewell to new friends was really tough, I really wanted those people to be here always for the first time my ‘geeky’ jokes were appreciated and I had like minded people with me.And reflecting my mood was Bangalore’s rain, it poured heavily that day.I left the conference hall with a heavy heart but with a hope to meet those people again.